This Saturday, May 4, Two Wheel Transit is hosting a free kid's bike fair and rodeo from 1:00-4:00 pm right outside the store at 817 S. Perry. This is a great opportunity, especially for residents of the South Perry Neighborhood, to help your children learn about riding safely and build up their skills. The Gonzaga Cycling Club is volunteering their services, but help is always appreciated. If you'd like to help with the rodeo, give Two Wheel a call at 747-2231. Better yet, bring your kids and their bikes. Also happening this Saturday is Beacon and Legs, the third mountain bike race in the Fat Tire Revolution series. The course consists of a 7-mile loop. Park at Camp Sekani. Cat 3 (one lap) race is at 10:00 am. Cat 2 (two laps) at 11:00 am. Cat 1/Pro/Open (three laps) is at 12:30 pm. There's a free kid's race at 3:00 pm. Parking is easy and cheap if you ride your bike to Bloomsday. The Spokane Bicycle Club will keep your bike and your stuff safe in a bike corral from 7:30 am-2:00 pm. It's in Riverfront Park in the meadow just south of the (blue) Howard Street Bridge. So right after you impress your friends with your Bloomsday PR, you can top it off by telling them how you rode your bike to and from the race. 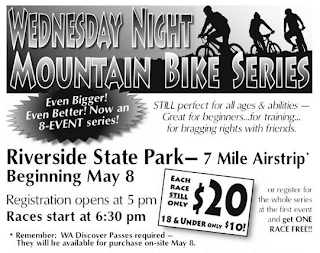 Back to mountain bike racing. 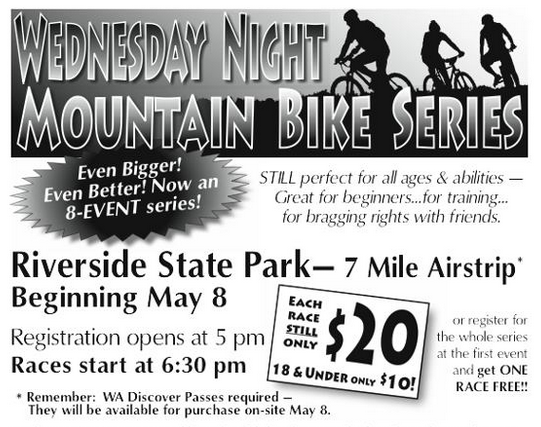 The first of the Wednesday Night Mountain Bike Races happens on Wednesday, May 8, next week at Riverside State Park. Don't forget your Discover Pass. Bike to Work Week is May 13-19. Register for the commuter challenge, which includes riding to work, riding to school, errands to the store, and all other non-recreational cycling. On Monday morning, May 13, breakfast will be at Riverfront Park again right across from City Hall. 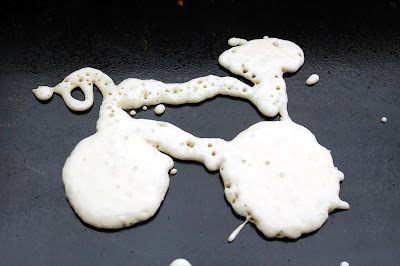 Mountain Gear will be cooking up pancakes and Roast House Coffee will provide coffee.